Although there are many options after high school, society often pressures students to go to college. 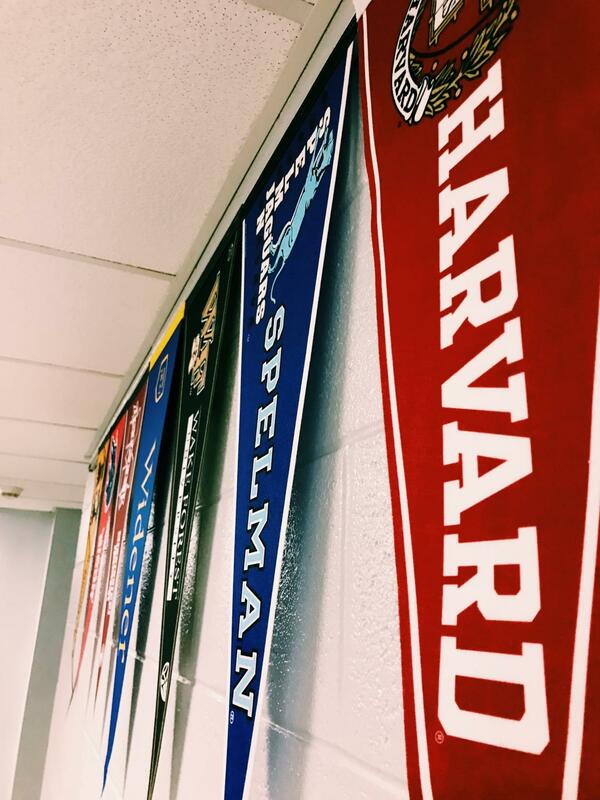 Flags hung up outside guidance office, promoting the different colleges. Students sit all day in schools working, learning, studying, and testing. Why? To prepare for their futures. But what does life after high school look like? I agree that many students should go to college for their next step. It is a place with great opportunities, and it provides the higher level education that often helps students find success. However, people have found success in other ways, and college is not necessary for everyone. Students need to find the right path for themselves. Although a majority of seniors pack their closets at the end of summer and say goodbye to their loved ones, college does not have to be everyone’s path. High school graduates have a choice with what they want to do with their life after high school. Graduates could travel the world, enter the workforce, go to cosmetology school, learn a trade, enroll in a college/university, or many other choices. The possibilities are endless. So why are high school students pressured to believe college is the priority after graduation? Society today has moved in a direction that makes people believe they need a college degree to get a decent job. Maybe that’s why so many students enter college, possibly without needing to. Of the 3.1 million high school graduates ages 16 to 24, 69.7 percent were enrolled in college in 2016. But that’s not the only option. DHS graduate Andy Helmer decided to take a year off before heading to college. Gap years, a year-long break in which students travel or work a regular job before focusing on further education, are becoming more popular, allowing students a chance determine what their future interests really are. “I wanted to take a year off because I wasn’t sure on what I wanted to do, and I didn’t want to waste my time and money,” Helmer said. Other students choose to enter the military either as a career or to earn money for college through the GI Bill. Young adults may gain a greater skill set in their area of interest if they decide to enroll in college, but some technical schools and 2-year degrees can be more useful and cost less money. The process of choosing the right path can be hard, and students often don’t look into other options because society has led them to believe that college is almost a requirement for success. Mr. Probert from Dallastown’s Counseling Office has helped many students with future plans. “It’s a process that can be difficult to navigate because it’s so big; however, there are a lot of good tools to use,” Probert said. All in all, it’s necessary for some students to go to college. Their future careers require that level of education, but students should feel free to follow their passions, college or not. While college comes with opportunities, it will come in a heavy cost after graduating from college and its student debt which its practically almost every college grad has due to the cost of tuition’s every year at a very high price. Debt is something you should avoid getting into 98% of the time but due to colleges being so expensive, you are guaranteed to get in debt that will take roughly 2 years to pay off after graduating from college. With society leaning away from colleges due to the price, the growth of technology and other cheaper alternatives of colleges, people and even some of my friends say that colleges is practically a scam primarily due to technology and yes other opportunities for high school grads to get into that is not involved paying that is almost the cost of a new car. You can look up on YouTube in search “College is a scam” (While colleges do again provide opportunities) and some videos will state that the system is out of date , rapid growth of technology (Google *cough*) which practically you can teach yourself but you still won’t get the requirements of a company lets say develops Video games (some chance you MAY get in), there are ways to educate yourself or seek opportunities that are cheaper alternatives to colleges without dealing with debt. Also not to forget that after getting out of college, you are going to have a hard time finding a job in the field you are in or companies not wanting you, further down the rabbit hole how the college system is to be. I”m not demotivating seniors and seniors in future to not go to college but if you are planning to, good luck on whenever the future takes you, hoping you don”t end up in situations where most college grads end up, including debt and difficulties of finding a job. Recreational vs. Travel Teams: Has the Stress of Competition Overpowered the Purpose of Playing?